MR. ATOMS! MRS. ATOMS! SISTER ATOMS! KID ATOMS, JR! Together, they’re the world’s most TRIFLIN’ superheroes! While on vacationing in Nevada looking for Niagara Falls in the early 70’s (somebody tried to tell them Niagara was across the country, but you know how NEGROES are! ), the Adams’ took a wrong turn down a desert highway and wound up driving into a nuclear test site during an experimental atomic bomb test. Unfortunately, the bomb explodes and the Atoms are bathed in a shower of devastating nuclear radiation. But something strange happens… Instead of killing them, the radiation from the experimental bomb mutates them into something more than human…or less (depending on who’s acting more of a fool). It gave them powers and abilities far beyond those of mortal folks. But now that they have super-powers, who in their right mind wants to risk life and limb to fight aliens, monsters and megalomaniacal super-villains?? Not the Atoms Family! They’re too busy perpetratin’, getting’ over, chillin’, flossin’ and trippin’! 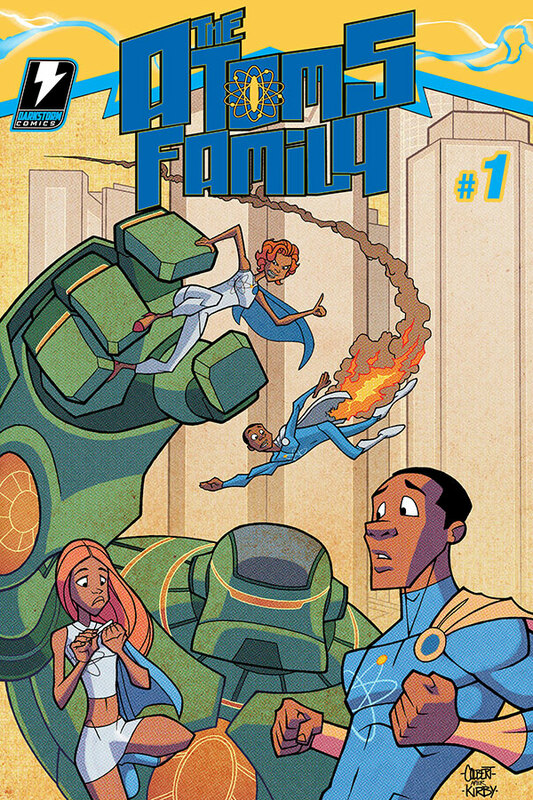 Join the hijinks and the misadventures of the Atoms Family and learn how NOT to be super-heroes!